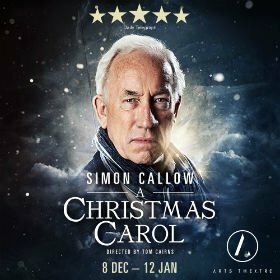 Following sell-out seasons in 2012, 2013 and 2016 and critical and audience acclaim, Simon Callow returns in this much-lauded production of A CHRISTMAS CAROL, playing at the Arts Theatre for a strictly limited season from 8 December. Intensely dramatic and profoundly heart-warming, A CHRISTMAS CAROL is one of the greatest ghost stories ever written. This is storytelling at its very finest. Dickens takes us on a man’s astonishing journey through his past, his present and (terrifyingly) his future, led by his three ghostly guides. Will Ebenezer Scrooge, tight-fisted, cruel and bitter, finally re-join the human race and learn to embrace the true generous and humble spirit of Christmas? From the miser’s dank and creaking house filled with shadows to cosy hearths, from stark graveyards to joyful festivities, this treasured story offers a celebration of goodness, a plea for justice and the promise of redemption. 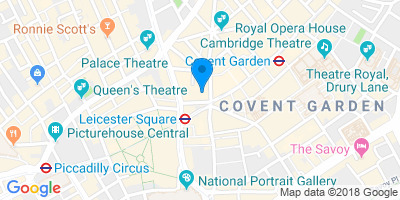 Charles Dickens’ A CHRISTMAS CAROL is one of the most beloved books in the English language and has become a classic Christmas tale for generations of grown-ups and children alike. Brought to life by the magnificent Simon Callow, this is a Christmas must see for 8 to 108-year olds! Valid on 2-3 Jan & 7-10 Jan 2019. Valid on all performances from 31 Dec - 12 Jan 2019.